Are you ready for a night of romance with an unknown stranger? What can you divine about our Mystery Date with only sound, organized in time? Where is your date from? When is your date from? Do you know who your date actually is? (If you do, then shhhhh!) Would you go out with your Mystery Date again? If you know who it is, don’t spoil it for the rest. Anyone who knows it can play the “mockcarr option.” (And I’ve got a hunch at least one of you know this one.) This option is for those of you who just can’t hold your tongue and must let everyone know just how in-the-know you are by calling it. So if you know who it is and want everyone else to know that you know, email Mr. Moderator at mrmoderator [at] rocktownhall [dot] com. If correct we will post how brilliant you are in the Comments section. Listen on and decide if you are wanting to get lucky! The real test of strength though is to guess as close as possible without knowing. Ready, steady, go! That’s right, I’m at it again with another Mystery Date! This one won’t be nearly as involved as the previous, as there isn’t much to say about this particular tune. I’m not sure how good of a mystery this is, you won’t need to be Sherlock Holmes to crack it. At least three members of this band went on to other, more successful, musical enterprises. It won’t surprise me if your blind date ends at “Hello,” but try to stick it out a little bit. After all, you don’t want to hurt your Mystery Guest’s feelings, do you? Give a listen – can you place the day, the time and any other details you care to note? I’ll be honest – I can’t say too much about this Mystery Date, but there are some tangents that can give the song a bit of context. But before we go there, take a listen and see if you can place the year and location. Shouldn’t be too hard to guess. Say what you will about this song. And if you know who or what it is, mum’s the word, m’kay? Here they are, direct from Scotland: The Beatstalkers! Bassist, Alan Mair, went on to be a member of The Only Ones, also serving as their co-producer. There are a few websites with info on this band, I can’t say I knew anything about them other than that they recorded a handful of songs by David Bowie, with the singer doing his best to turn his accent from Scottish to English. 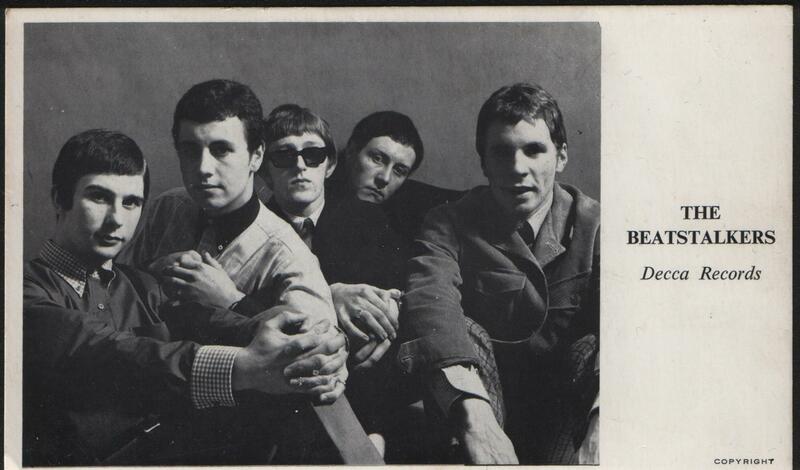 According to their All Music bio, they formed in 1962 and became wildly successful in Scotland.They signed a deal with Decca in 1965 and then moved to London in 1967. At this point, they hooked up with a manager who also counted David Bowie as a client. He had the band record three of Bowie’s songs under a new contract with CBS. Despite their huge success, previously, at home, they were unable to get any traction in the big city. The saddest part of the bio, to me, is that it states the band broke up after a van containing all of their equipment was stolen! I guess it was the last straw. If I am understanding the timeline correctly, Alan Mair opened up a clothing shop in London between the Beatstalkers and the Only Ones, where he sold leather clothes, platform shoes and other glam clothes, employing Freddie Mercury until Queen found success. While this band is mostly a footnote in rock history, people who lived in Glasgow in the early to mid-60s considered them Scotland’s answer to the Beatles. Hope you enjoyed this Mystery Date, maybe you’d like to see them again, dinner and a movie, perhaps.